Dimension is a soundbar with exceptional acoustic qualities perfectly adapted to flat screens. 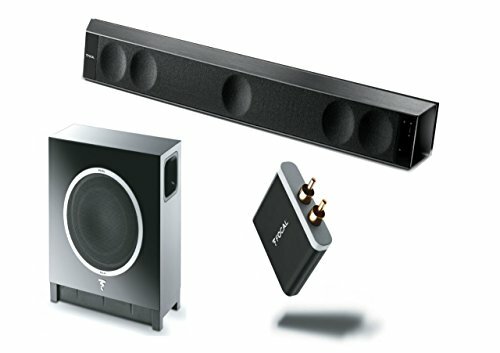 R&D teams offer you a soundbar capable of restoring a quality sound with clear and natural-sounding dialogues thanks to five ultra-flat patented speaker drivers. Dimension is the response to the desire of flat screen's owners for powerful sound in a discreet and perfectly integrated audio system. Finally offer to your images the sound and emotions they deserve! The Universal Wireless Receiver enables wireless connection of all your Bluetooth-compatible devices to your amplifier or multimedia system. Get more freedom for your mobile devices without impairing audio reproduction quality. The apt-X codec achieves a 4:1 compression ratio, allowing for near-CD quality listening. Full 5.1 system produces dynamic and coherent reproduction of the whole frequency spectrum. Shockingly detailed and immersive sound.